I got to walk in on a rehearsal for PETER RABBIT yesterday and it was absolutely breathtaking. 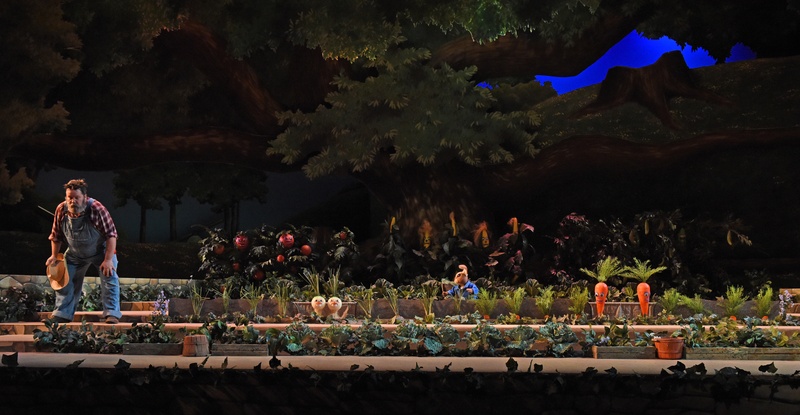 The stage was completely full and Mr. McGregor’s garden was massive and so beautiful. Peter was talking about temptation and how hard it is to be good. I can appreciate the lure and the power of temptation that Peter experiences, but his mom is just trying to keep him safe; something all moms seek to do. In this case, Peter’s mom isn’t worried about skinned knees or even broken bones, she is worried that he will get picked up by the farmer and baked into a pie. She’s not being paranoid or overprotective either, she’s worried because that’s exactly what happened to Peter’s father! Fact: if you are caught by the farmer, you will be eaten. So remind me, Peter, why it’s so hard. Is that cabbage or carrot or whatever really going to be worth the risk to your cute little furry self? Apparently, it is. So far, I have not been able to lure my kids away from an activity by telling them they’ll be baked into a pie, but still, somehow my telling them not to do something makes it all the more appealing. I think the same is true with Peter. If mom says not to do it, it MUST be good, because obviously mom doesn’t want me to have any fun, ever! 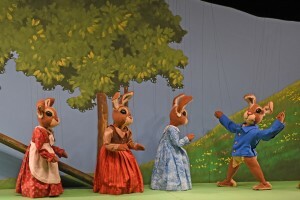 I can’t wait to bring my kids to see THE TALE OF PETER RABBIT. Not only am I hoping they’ll learn something about listening to their parents, but I just know they are going to love the show. But the mom part of me that worries will just be thinking of my friend Trish backstage, and all the Cirque de Soleil-type acrobatics they’re having to do backstage to make Peter and his family come to life onstage. You’re doing what? Running? In the dark? Going up ladders with gloves? Running up ladders in the dark with a hood over your head? No, Trish, NO! I’ve told her several times that I’m going to call her mom and tattle on her, but I guess she’s a grown up and a “Master Puppeteer” so I have to assume she knows what she’s doing. It’s always so hard to balance the need to keep those you love safe and wanting them to experience life at its fullest, take risks, and try something new. Often dangers aren’t spelled out so clearly as they are in Mr. McGregor’s garden, so we just have to follow our gut sometimes and revel in the beauty when we get to see art with an element of danger carried out effortlessly. Every parent will be able to relate to Peter’s poor mom with her premature white whiskers. We’re all just trying our best to be good. And just so you have the opportunity to appreciate the craziness that you don’t see behind the scenes, check out this video. 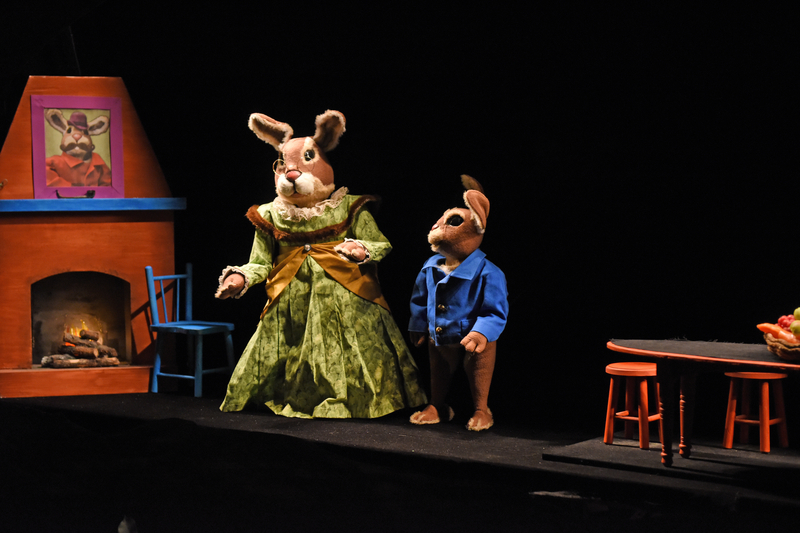 Hats off to you Puppeteers! Be careful out there! THE TALE OF PETER RABBIT runs from March 13 to April 5. To purchase tickets call 214-740-0051 or visit dct.org.